You might have noticed that the cooking on this blog has decreased slightly. It’s because I’ve been sticking to very simple dishes using a lot of vegetables lately, as the effect of over-indulging the last couple of weeks have reared its ugly head: Namely a couple of extra numbers on the weighing scales. Note the plural as I had wanted to make sure they aren’t all FAULTY at the same time. Anyway, I’m sure you don’t want to be taught how to cook a soup full of vegetables, or do you? Although I could talk about something more exciting than broccoli and cabbage soup too. It’s the Korean dish everyone seems to be quite fond of. 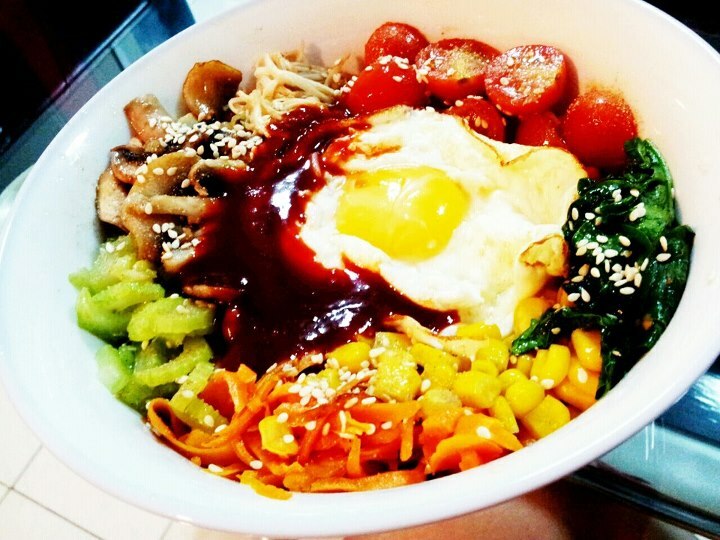 There’s no denying how much I love cooking and eating Bibimbap (Korean Mixed Rice Bowl). It’s one of my go-to dishes whenever I feel like something healthy and quick. 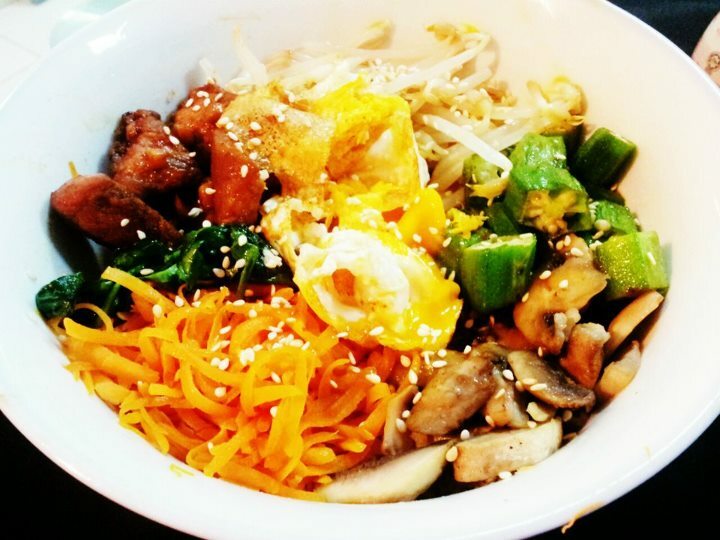 Since I last posted about Bibimbap, I’ve simplified the recipe even more. There won’t even be a recipe here, I’m afraid. Because this dish is as versatile as it comes. Instead I’ll show you the variations you can do using ingredients you already have at home. This is perfect for Meatless Monday, or anyway you feel like taking a rest from all that meat. Here I used Cherry Tomatoes, Carrot, Corns, Baby Spinach, Celery, Mushrooms (Cup and Enoki) and Eggs on top. Everything is slightly sauteed in either olive oil or sesame oil, lightly seasoned with light soy sauce (or salt) and sprinkled with toasted sesame seeds. I usually only use about 4 tablespoons of Brown rice for one serve. You can find the Gochujang recipe here. Can’t live without meat? The Pork is marinated in Spicy Bulgogi sauce (Gochujang, Soy Sauce, Mirin, Garlic, Salt and Pepper) and then quickly stir fried in sesame oil. I’ve used Okra, Mushrooms, Carrot, Bean Sprouts and Egg too. Like the last one, these were individually sauteed and seasoned. It’s going to get even easier soon! Few months ago, I’ve swapped the rice over to Quinoa. And surprisingly, it’s so much tastier! I’ve never looked back since. To cook Quinoa. Simply take a cup of Quinoa, rinse it thoroughly, and cook with 2 cups of water until all fluffy and the water absorbed. This will feed about 3-4 people (4 tablespoons for me). Apart from my usual choices, I’ve also added Cauliflower and Broccoli. Trust me, you won’t even miss the meat. Quinoa would provide more than enough protein anyway. 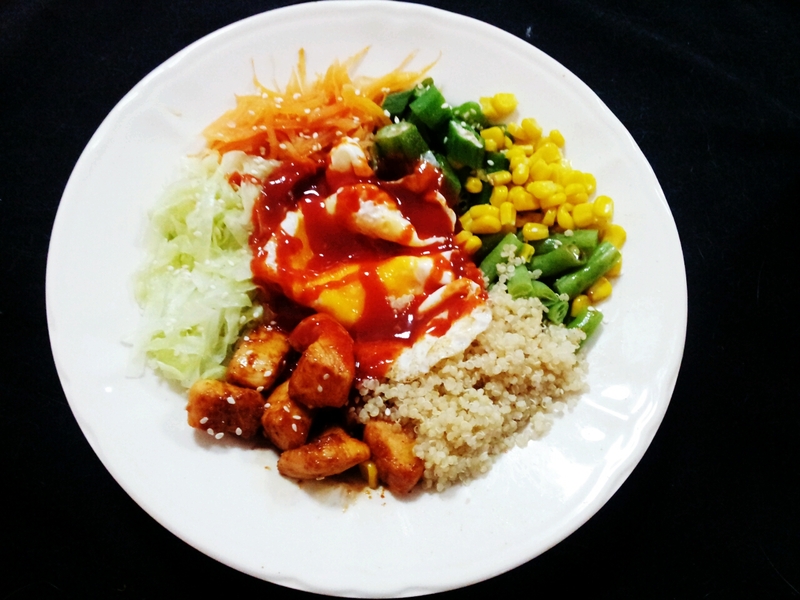 And this brings us to the easiest way of preparing Bibimbap. No more sauteing individual veges. Just arrange them neatly on a plate and steam all of them together! I’ve used Cabbage, Carrot, Okra, Corn, and Green Beans. Apart from that, I stir-fried the Chicken Breast bites (same marinate as the Pork Bulgogi), and fried an egg too. Of course, the Quinoa is prepared separately too. I drizzle some sesame oil and sprinkled some soy sauce after the veges are done. The whole process takes about 20 minutes (including cutting the veges). The Bonus: Steaming is the best method to cook vegetables as you can preserve the most amount of nutrients. I also made a vegan version of this for Frank as he doesn’t eat chicken and didn’t feel like eating egg that night. So now that you’ve seen all these variations of Bibimbap, I hope that you’ll be inspired to make your own soon. I’m sure you have at least 5 types of vegetables in your fridge/freezer at any given time. And if you don’t, you might need to change your eating habit! No, really! 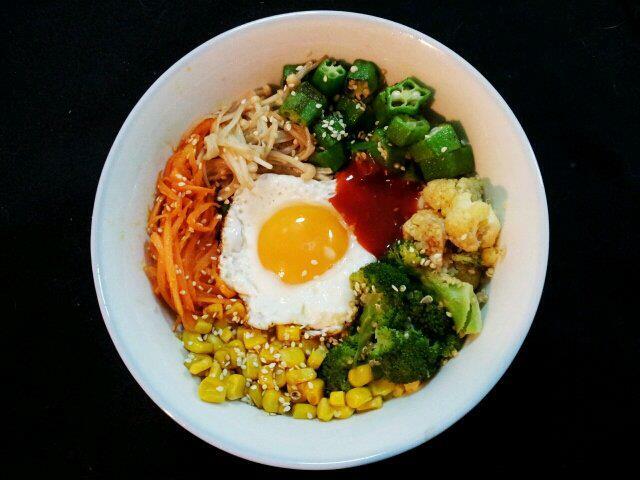 What are your favourite Bibimbap toppings? I promise I won’t be boring forever. Once I get rid of those extra numbers I’ll be back with more interesting dishes. Maybe even some cakes! P/S If you haven’t noticed my constant spamming on social media, I’ve been nominated in the bloggers choice category for the Time Out KL Food Awards. Anyone with a computer/smart phone/iPad can vote, so do head to http://www.timeoutkl.com/foodawards and look for No.19. The Original Post is here. If you like some tips for other category: Pssst…. Sid’s Pub for Best Pub Grub, and Al-Amar for Best Middle Eastern Restaurant. Thank you so so much! Yes!! Super easy to make at home! Yes! Kimchi would be excellent too! Wonder why I’ve never put it in the Bibimbap before….. it’s such an obvious choice! At least this is really simple to make, I’m sure you and your missus will enjoy this dish as much as we do. Oh!!! I’ve voted for you on timeout. Dunno the rest in the other categories so I just simply picked one for each. LOL!!! Ah yes! I did vote for Al Amar… Can’t remember who I chose for the pub grub category – I think it was Sid’s. Kelly, I dont believe you when u say tht u have clocked extra numbers on your weighing scale. I saw a photo of u the other day on FB and u still look so slim! Hehe. Anyhow, you bibimbap looks so colourful and healthy! Hehe have to breathe in when I take picture.